Why should you switch to a SIM Only contract? If you’ve got a phone you’re perfectly satisfied with, and you’re not too fussed about getting a new one, a SIM Only contract will be perfect for you. You get all the usual network benefits with a SIM Only contract. So if you’re happy with your phone but not quite so taken with your current network or contract, it could be time to make a switch. Switching from a pay monthly phone contract to SIM Only is a great move if you want to reduce your mobile spend. SIM Only deals are usually much cheaper than standard pay monthly contracts for one simple reason – you’re not paying off the cost of a phone each month. Short-term SIM Only contracts give you freedom and flexibility. Virtually all networks offer them from as little as 30 days, and you can then keep them rolling month-by-month - so you don’t have to commit to a long term deal if it’s not right for you. If your future plans are unclear and you don’t know what you’ll be doing (or where you’ll be) this time next year, get a SIM Only deal. If you've got your eye on a particular phone that hasn’t been released yet, going SIM Only could be a good move. If you get a rolling monthly deal, you can cancel it as soon as your dream phone is released. You’ll then be able to get your new phone on a pay monthly contract, or buy it SIM free (see our final point below). If you want a new phone, there’s an alternative to buying it on a long-term pay monthly contract. Instead, you can pay upfront and buy it SIM free. SIM free phones are unlocked, so you’ll then be able to pair them up with a SIM Only contract on any network you choose. Doing it this way means that you’re not tied down to a lengthy contract. And if you pay for your SIM free phone with a low interest or interest-free credit card, it could work out cheaper than a pay monthly phone deal – even when you add on the cost of your SIM Only contract. A SIM only deal works in almost the same way as a normal mobile phone contract, except that the deal doesn't include a phone. You simply get a SIM card (so it's 'SIM only'), along with an agreed amount of monthly minutes, texts and data. What are the benefits of buying a SIM only deal? SIM only deals are great if you want to cut down on your monthly mobile bill, because they're usually cheaper than standard monthly contracts. It's ideal if you've got a phone you're perfectly happy with. It gives you the flexibility to change networks, and take advantage of different network benefits. If you're waiting for a specific phone, but it's not on sale just yet, SIM only is brilliant. Because of the short contracts, you can end your contract and get the phone of your dreams whenever it launches. A nano SIM is the smallest SIM card. You’ll find it in phones such as the iPhone 7, iPhone 7 plus, Samsung Galaxy S8. 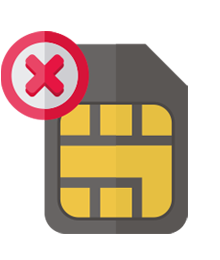 A micro SIM is the second smallest size of SIM card. The iPhone 4s, the Samsung Galaxy S5 and S4, LG G5 SE all use this size. A standard SIM is the largest SIM card. They are used in some older smartphones such as the iPhone 3GS, Samsung Galaxy Note, and also in basic phones like the Nokia 105 and the Nokia 150. When you buy a SIM only deal from us, it will come in the form of a multi SIM. It consists of three parts which are a combination of the nano, micro and standard SIM cards. They are designed to fit any device and you simply pop out the size to fit yours. Is a 30-day or 12-month SIM only contract best for me? The big benefit of a 30-day SIM only deal is flexibility. It means you can end a deal and start a new one almost whenever you want. If there's a phone you're waiting for and you know it'll be on sale in only a few weeks, a short 30-day SIM only deal is the perfect choice. Where can I find the best SIM only network deals? You can view the best deal on offer from networks such as EE, O2, Vodafone, ID and Virgin with us across the widest range of handsets. When you find the deal you know you want, simply add it to your basket, select a delivery option, and complete the checkout process. You'll be asked to set up a Direct Debit, and also provide some information that allows us to carry out a credit check. Subject to approval, your SIM card will be delivered on the date you requested. An upgrade deal is when you buy a new deal on your current network to replace your old deal. You can often get better deals by doing this. The fastest way to check if you can upgrade to a pay monthly SIM only deal is with our Upgrade Checker. Just fill in your details and it'll let you know straight away whether you can upgrade today. Whether you'll be able to upgrade or not depends on how long you've had your current deal (the length of time varies by network), and also whether you're on pay as you go or pay monthly. Have a look at our upgrade help page to find out more. Some tablets can connect to the internet using a network's mobile coverage, in the same way that smartphones do. These are sometimes called connected tablets. We sell special SIM only deals that include a set amount of data each month. Slot these SIMs into your connected tablet and you can get online anywhere.